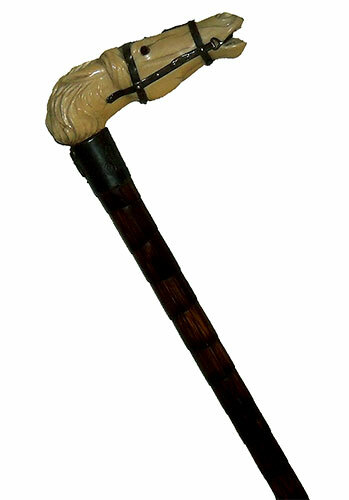 Ivory Horse Canes come to the market occasionally but are usually considerably less heroic than the scale of this fine one. The carving is very detailed and expresses the drama of a race horse extended to the maximum of its capabilities. The flared nostrils, delineated veining, and ears flattened back all express the animals' straining for the win. The deeply incised mane carving accents the feeling speed and motion. The metal work in the crafting of the detailed sterling silver bridle and bit with the buckle detailing is also exceptional. 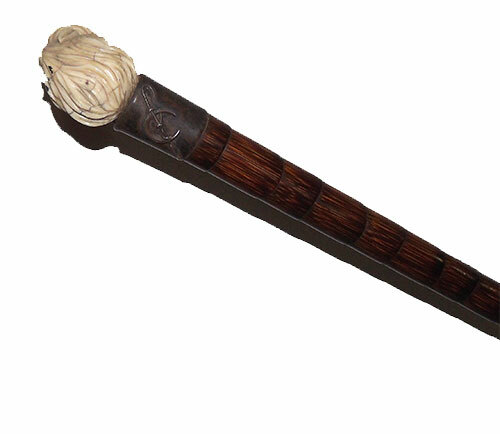 The shaft is made of Partridge Wood and is a nice visual contrast to the ivory carving. The wide sterling silver band has an applied silver crop and horseshoe as a decorative element and is engraved with a flourish of initials, one of which appears to be an "N". The horse head handle is 1-1/2" high and 4-3/4" long. The overall length of the cane is 32-1/2 inches. This is a piece that obviously belonged to a person of means., perhaps the owner of a racehorse as would befit the subject matter.